Spacious Vacation Home on Crystal Lake! 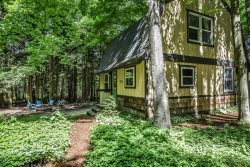 Hidden River Cabin on the Betsie River! Nestled on a quiet drive on Crystal Lake's amazing south shore, this beautiful home has plenty of space for the whole family. Three bedrooms offer privacy for adults, the kids can stay in the 'play room', which is nearly soundproofed from the rest of the house and has a sofabed and a murphy bed. The handicap accessible bathroom offers a high rise toilet and step in shower with grab bars. Also you can enjoy an outdoor shower after a day on the lake. The driveway to this cottage is EXTREMELY steep, and can become slippery. We do NOT recommend trailers. Please notify Crystal Vacation Rentals if you will have more than two vehicles. All rates and amenities are subject to change until rental agreements are approved by management. Please see our terms and conditions, FAQ, and contact a reservation agent for more details. Great for a fun group of senior ladies. Danielle has been helpful and friendly for a year while I made these arrangements. A year ago I needed handicapped bathroom and three bedrooms on one floor. Turned out I didn't but it was still a nice home. It was disconcerting to have so much personal memorabilia around, as well as multitudes of knickknacks. It felt like the owners were at the store and would be back any minute to find us broken into their home.